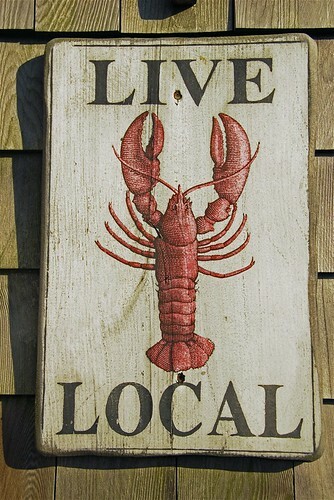 Looks like we should put the lobstermen of Maine in charge of all the fishes. A study has now confirmed what they've known for years - you just can't kill all the grownups. According to the NYT, scientists have determined that when you set minimum sizes to a legal fishing catch, evolution kicks in and causes the fish to mature earlier, i.e. when they're still too small to be kept. Clever, yes. But too clever by half - these early developers don't reproduce as effectively and aren't as healthy. As the article observes, "in some areas, as much as 50, 60 or even 80 percent of the stock may be caught every year," which is to say almost all the adults end up in the nets. Meanwhile, up in Maine, lobstermen pioneered a technique of saving reproducing females from the traps - any female lobster caught with eggs under her tail receives a permanent Get Out of Jail Free card thanks to a notch cut in her tail. Lobsters with notched tails, with or without eggs, get thrown back whenever they're caught. That allows for a higher percentage of the adult population to survive each year, which means more growth which means better population health overall. For those so inclined, you can read about lobstering in great detail here. Lobstermen, of course, have the advantage of personally handling every lobster that gets hauled up and the lobsters themselves oblige with obvious qualifications for the Notch of Life. Still, it appears that fisheries will only truly recover if we set quotas even lower than planned. A higher survival rate of adult fish is the only way to reduce the selection pressure. In other words, catch less. I swear it will work. Just ask the lobsters.